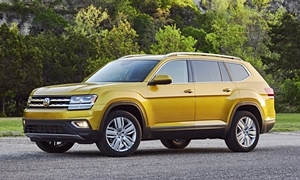 12/31/69 Volkswagen group of america, inc. (volkswagen) is recalling certain volkswagen atlas vehicles. the fuel tank on these vehicles may leak fuel due to a manufacturing error. as such, these vehicles fail to comply with the requirements of federal motor vehicle safety standard (fmvss) number 301, "fuel system integrity." Volkswagen will notify owners, and dealers will replace the fuel tank, free of charge. the recall is expected to begin june 15, 2018. owners may contact volkswagen customer service at 1-800-893-5298. volkswagen's number for this recall is 20aw. note: this recall is an expansion of recall 17v-766. 01/10/18 Engine Volkswagen group of america, inc. (volkswagen) is recalling certain 2018 atlas vehicles. the fuel tank may have been manufactured with insufficient wall thickness, potentially resulting in the tank leaking fuel. as such, these vehicles fail to comply with the requirements of federal motor vehicle safety standard (fmvss) number 301, "fuel system integrity."